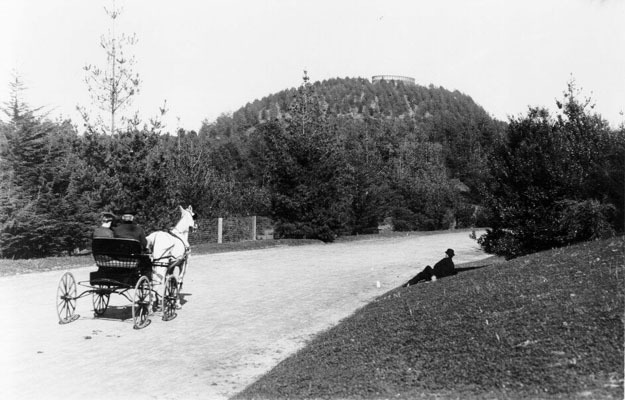 Looking at pictures like this one (South Drive, Golden Gate Park, probably dating to the late nineteenth century, SFPL/AAA-8339), it’s tempting to romanticize the park before the advent of the automobile. But the following hair-raising report from the San Francisco Chronicle, Feb. 21, 1886, paints quite a different picture. ” One of the most exciting and serious runaways that ever occurred in Golden Gate Park took place there yesterday afternoon. Miss Lillie Linnikau of 927 Golden Gate Avenue and a friend thought to enjoy the delights of an afternoon ride around the park, and accordingly hired a rig at French’s livery stable on Golden Gate Avenue, consisting of a sprightly animal and a two-wheeled phaeton. All went serenely until the pleasure-seekers reached the corner of Stanyan and Haight streets, where the horse became very much alarmed at the Ocean Railroad dummy. In a moment he was unmanageable, and started off at a dangerous speed, throwing both the ladies out and injuring one quite severely. Reaching the main entrance of the park, the horse, by this time fairly crazed, turned in and tore up the avenue at a frightful pace, the cart bounding and dodging around in the animal’s rear as if hardly touching the ground. At the place called Chickens’ Point — the mound covered with greensward, where the children play and older persons lounge — were standing the handsome family horse and double-seated phaeton belonging to Mrs. Hoadley, in which latter she was seated with the two Misses Rogers. Seeing the great peril that threatened them in an instant, she endeavored to turn her horse to one side and give free way to the maddened runaway, but too late. One shaft of the cart struck Mrs. Hoadley’s horse just above the breast collar and plunged into the creature’s lungs nearly eighteen inches, and snapped off like a straw. The obstacle turned the runaway from his forward course around to the right, where was standing one of Bridge’s rigs, driven by J. King. Mr King was more successful than Mrs. Hoadley in getting out of the way. He gave his animal a cut with the whip that caused her to shoot ahead with a jump about twenty feet, and the passing cart caught the bind wheel, doing no other damage but spring the axle. From this point the frenzied beast plunged right down the stairs into the small grounds occupied by seats and filled with vehicles and people. The first obstacle encountered was a buggy occupied by Mr. and Mrs. Detrick, which was smashed into fragments in an instant and Mrs. Detrick very badly injured. Another buggy standing near suffered a like fate, and the horses attached to both became frightened and ran away. The mad career of the runaway came suddenly to an end in another moment by his jumping into a garden plot on the opposite side and getting so entangled in the harness that he fell and was caught. In the music grounds there was a fearful panic. Three mad horses were tearing around and the area was densely filled with people, but fortunately they were all subdued without anything more than some severe bruising and scratching, resulting in the rush of the crowd. Mrs. Hoadley’s horse stood perfectly quiet amid all the excitement and the instant after the shaft struck him she bounded out of her phaeton and pulled the broken fragment out of his bleeding breast. The animal simply trembled and cried, but still never moved and Mrs. Hoadley held a handkerchief to the wound until Mr. King returned with Dr. Teval. As quietly as possible the ambulance kept by the Society for the Prevention of Cruelty to Animals was procured and the bleeding horse conveyed to Dr. Teval’s veterinary hospital. This entry was posted in events in Golden Gate Park, history, safety and tagged golden gate park, golden gate park history, horses in the park, safety, stables in the park. Bookmark the permalink.